Also, that post title is supposed to be “The Book This Blogger Enjoys,” but seven bajillion apologies to all Spanish-speakers of the world if I just mangled that. I am not one. A Spanish-speaker, that is. Where was I? Oh. Right. 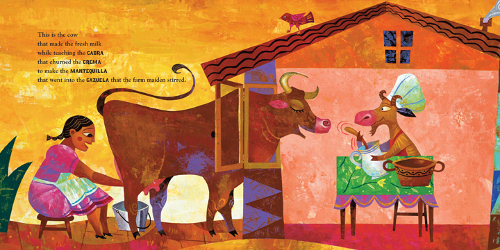 That sun, as well as this goat to the right, comes from one of my favorite early-2011 picture books, written by Samantha R. Vamos and illustrated by Mr. López, The Cazuela That the Farm Maiden Stirred (Charlesbridge, February 2011). Think of this as the bilingual “The House That Jack Built.” But, okay. Well, there is no malt or rat or shaven and shorn priest or farmer sowing his corn. 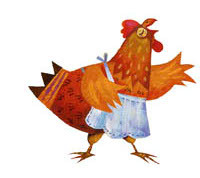 Instead, we have a farm maiden, who is quite the opposite of forlorn, as she’s happy to be baking. Mmm. Baking. There’s a goat churning cream, a duck heading to the market, a donkey plucking a lime, a farmer planting rice, and much more. They’re getting ready for a rice pudding celebration — the yummy treat, that is, along with some dancing and singing and banjo-playing and maraca-shaking. And so on. (Those Spanish words are not only capped and in a separate type, but they’re also bolded.) No glossary of Spanish terms even necessary, though the author does provide one at the end, it turns out (as well as pronunciations, heaven bless). As well as a recipe for arroz con leche, or rice pudding. Mmm again. 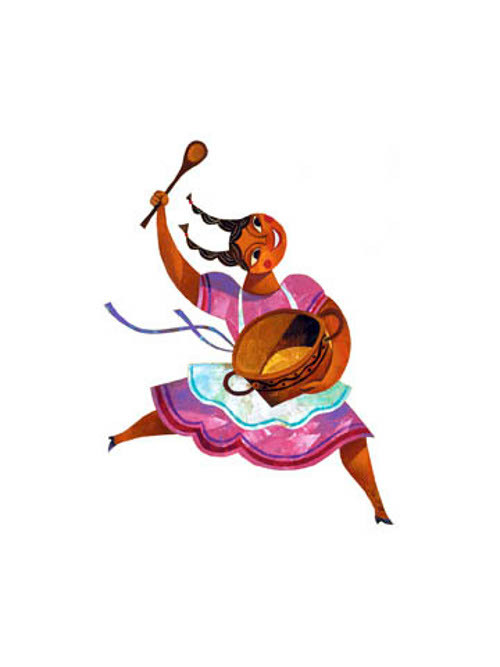 And Vamos knows how to build momentum with each page turn, as the tension in the tale builds until—while everyone was having too much fun dancing and celebrating—the cazuela “simmered and sputtered” and “bubbled and burbled” and nearly burst. Fortunately, the farm maiden catches this in time, and the animals join her in stirring the pudding to satisfaction. 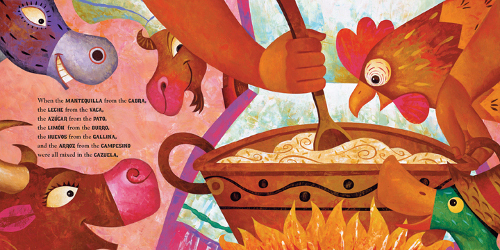 THE CAZUELA THAT THE FARM MAIDEN STIRRED. Copyright 2011 by Samantha R. Vamos. Illustration © 2011 by Rafael López. Published by Charlesbridge, Watertown, MA. Gracias for introducing us to this 2nd book by Vamos! I’m already a huge fan of “Before You Were Here, Mi Amor” so I’m looking forward to reading this one aloud to my kids over and over again. Love the warmth and vibrancy of the art! Mmmmm, rice pudding . . . 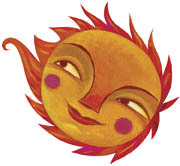 I love that you mentioned Rafael’s sun. It is one of the first things I noticed and admired when poring over his paintings for the book. 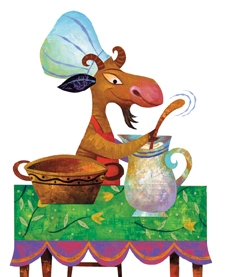 I feel like Rafael stirred La Cazuela with his paint brush and added magic and whimsy. It was very exciting to discover this review this morning -over my breakfast! Thank you. Yum! I mean that about the art as much as the arroz con leche. 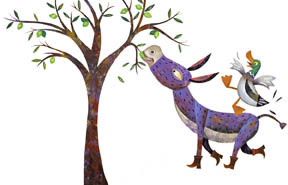 And what a brilliant concept for a bilingual book. So great! LOVE the illustrations.